To demonstrate Americans' support for Israel's defensive action against Hamas kidnapping and rocketing of Israeli civilians, L.A. Zionist organizers staged one of the largest, Israel support rallies in the history of L.A., Sunday, July 13th. The Israel American Council and StandWithUs attracted 1200 and 1800 Israeli-Americans and Zionistic Jews and Christians to attend. 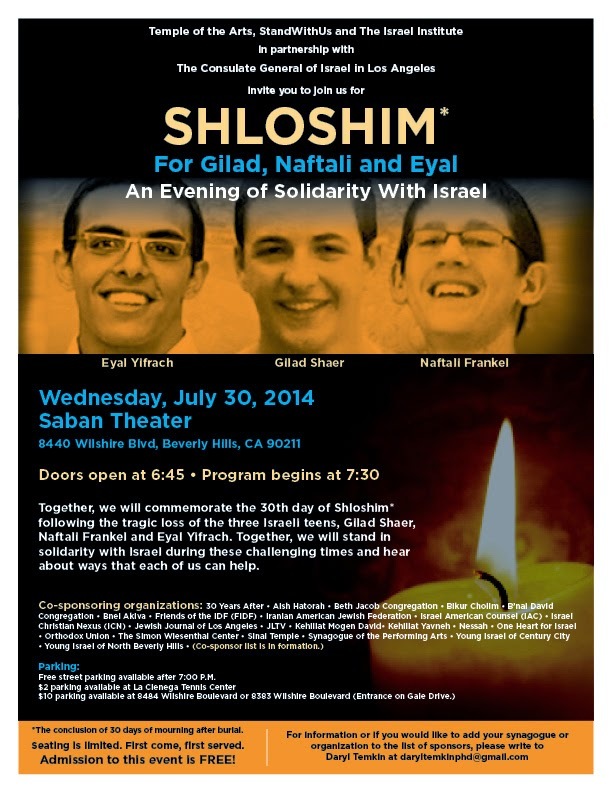 Speakers included Rabbi Marvin Hier, dean and founder of the Simon Wiesenthal Center, Roz Rothstein co-founder and CEO of StandWithUs, Los Angeles City Attorney Mike Feuer and Israeli actress and activist Noa Tishby, among others, according to Ryan Torok and Jared Sichel in the L.A. Jewish Journal. Four Arab Muslim men were arrested for assault with a dangerous weapon after striking some Israeli supporters with their Palestinian flagpoles. A Federal Protective Service officer fired a gunshot to stop the thugs from fleeing. Several attendees shared their motivation to be there. Social-commentator Evan Sayet describes the gathering - and the out-of-context media-bias which has incensed both sides of demonstrators- those to condemn Israel's actions and those who defend them. Rabbi Moshe Parry says that the I.D.F. must carry-on until they cease Hamas' rocketing abilities. Jewish-American, Ethan Samuels was wounded by a Palestinian suicide-bomber at Tel Aviv's Dolphinarium Disco. American student, Sarah, was gashed in the face with a rock thrown by a group of Palestinians weeks ago in Jerusalem. Shariff "Mordechai" Hazan, who was raised in Sufi-Islam- tries to enlighten liberal-minded people that Hamas is the Jew-hating branch of the global jihad- whose Boko Haram recently enslaved 200-300 African Christian girls into slavery and slaughters Christians throughout Africa and Egypt. Avichai ben Shmuel says that 3 Arabs driving-by, fired a starter's pistol at some of the Zionists, intending to provoke them into greater violence. He says what he heard that the L.A.P.D. did. Pro-Hamas / anti-Israel rallyers held a demonstration at the Israeli Consulate in West Los Angeles on Tuesday, July 8th to protest Israel's striking Hama's human-shield deterents to defensive curtailment of Hamas' rocket-launching. But judging from the participating groups that returned for Sunday's counter-rally, the Muslims' and Communists' (bearing AnswerCoalition placards) over-riding goal is the irredentist, Muslim conquest of capitalistic, Jewish Israel. 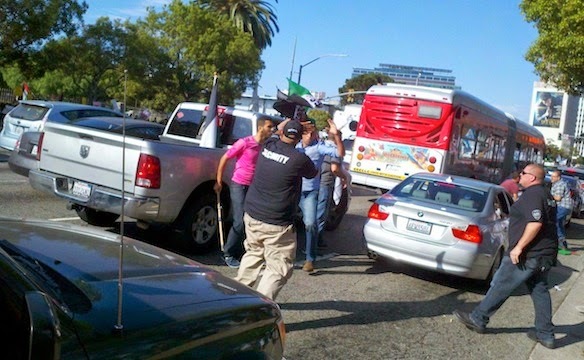 Riot-helmeted, L.A. police attempt to keep the pro-Hamas and pro-Zionists apart. Pro-Palestine protestors stayed organized and on-message in their chants while standing or marching. Unfortunately, they revealed their message was not just against Israel's air-assault on Hamas leadership, but to eliminate the Jewish state entirely. Political pundit Eric Golub, an author and blogger at Tygrrr Express, characterizes the Hamas supporters' counter-rally as Islamists. Rabbi Moshe Parry tells the true, Jewish history of the Judea / Palestine which the pro-Hamas protesters are trying to stake claim to. A large Pro-Hamas / anti-Israel rally was held at the Israeli Consulate in West Los Angeles on July 8th to protest Israel's striking Gazan human-shields during its defensive curtailment of Hamas' rocket-launching. But judging from the groups returning for Sunday's counter-rally, the Muslims' and far-leftists' (revealed on their AnswerCoalition placards) over-riding goal is the irredentist, Muslim conquest of capitalistic, Jewish Israel. Four Arab men were arrested at the pro-Israel peace rally in front of the Federal Building in Los Angeles Sunday after pro-Palestinian protesters also turned up and the two sides clashed. At least one gunshot was fired by a Federal Protective Service officer, the Los Angeles County Sheriff's Office said. The men then got out of the truck and confronted the group, and used the wooden sticks holding their flags to hit the demonstrators, said Sgt. Dave Valentine. “It was a pretty chaotic thing,” he said. Witnesses said that several of the pro-Israel participants were hit by the poles, and one person was wounded. When police who were already on the scene stepped in to break up the scuffle, the attackers tried to flee the scene in their pickup truck. Witnesses say a Federal Protective Service officer on-scene fired a warning shot into the air. Los Angeles police caught up to the vehicle and arrested the men, identified as Mostadafa Gamaleldin Hafez, Hassan Mustapha Kreidieh, Mohammed Said Elkhatib and Fadi Ali Obeidallah. They were booked on suspicion of assault with a deadly weapon. They were released after posting $30,000 bail on Monday. The Federal Protective Service agent was placed on administrative leave. (Combined sources: L.A. Times, KNBC-TV, Jewish Journal). In the moments before the flag was grabbed, the men in the truck had been shouting taunts at the demonstrators and at Friedman and her car’s occupants, she told The Times. The men were “taunting and threatening the ralliers [sic],” and thrusting wooden sticks in the direction of the protesters standing on the sidewalk next to the federal building, she said. “They were looking for a fight,” she said. Video and media photographs from the protest support her claim that the men were engaged in a verbal altercation with the protesters, who can be heard on one YouTube video yelling insults back at the men as they drove off. (L.A. Times Joseph Serna, Matt Stevens). The pro-Israel rally was organized by the Israel American Council and StandWithUs. Attendance was estimated at between 1200 and 1800 people. Several attendees shared their motivation to be there. In this JooTube.TV video playlist, you can watch statements from Evan Sayet, on the leftist mainstream-media bias which incites anti-Israelism. Ethan Samuels, an American Jew who was wounded by a Palestinian suicide-bomber at Tel Aviv's Dolphinarium Disco. Sarah was hit in the face with a rock thrown by a Palestinian. Shariff Hazan, converting from Sufi-Islam- is trying to alert Jews and Christians to the perils of Islam- which plagues and enslaves Africans to this day. Avichai ben Shmuel shares info on another shooting in connection with the rally. Eric Golub, pundit and author, perceives the Jihad welcome on American streets. Rabbi Moshe Parry tells the history of the Palestina which the pro-Palestine protesters are claiming to be there own. Islamists in Gaza have rocketed Israeli civilians (a war crime) for every month over the past 10-years- a total of more than 8,000 projectiles. 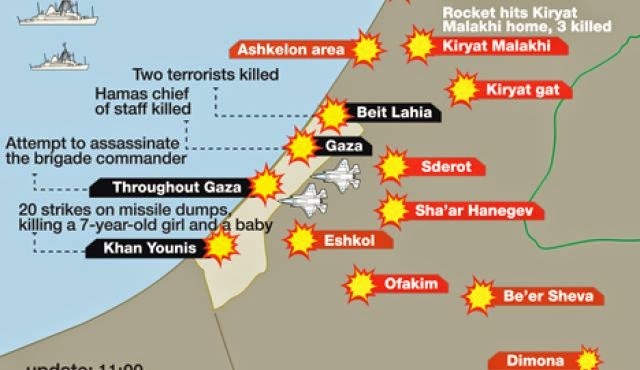 Now, hoping to elicit abscondable humanitarian aid, Hamas provokes a war in which they sacrifice civilian human shields (another war crime) to discredit Israel in the world's eye and portray themselves as victim. The IDF spokesperson's office relased this video of Hamas' spokesperson encouraging their people to serve as human shields. How ethical does the Israel Defense Forces need to be in eradicating these rocket launchers and Hamas' will to continue their struggle to destroy the Jewish state? I.D.F. Tanks commander, Colonel Benzi Gruber lectured for an American group weeks ago on what the I.D.F. has to sacrifice in order to maintain its ethical standards. Col. Gruber speaks with JooTube regarding "Ethics in the Battlefield." On Independence Day, the survivors of Vicky Hen held the 12th Independence Day Memorial for victims of the 1st jihadist attack in California- upon the El Al ticket counter of Los Angeles Airport's international terminal - on the 4th of July 2002- 9-months after Sept. 11, 2001. The ceremony by Vicky's survivors, father Avi, mother Rachel, and brother Udi, were comforted by around 3-dozen attendees and speakers. For the first time, a Consul General of the Israeli Consulate to the Southwestern U.S. attended. Video: Israeli Consul General David Siegel connected the jihad of Egyptian Hesham Hadayet seeking paradise by killing Vicky Hen and passenger's friend Jacob Aminov of North Hollywood - with the jihad warfare being conducted by Palestinians through rocketing, kidnapping, and killing Israeli civilians. He acknowledged the supportive presence of Leehy Sha'er, whos nephew, Gil-Ad Sha'er was among the trio of yeshiva students abducted, shot, and burned by Palestinian followers of Hamas. Elan Carr, an L.A. Deputy City Attorney prosecutor and candidate for US Congress, calls to recognize global Islamism as democracy's enemy. Hebrew and Arabic-speaking Elan Carr served in the US Army as a military lawyer in Iraq and serves on reserve duty annually. He prays for strength and determination in our government policies to defeat the Islamist enemy of liberty. Rabbi Zvi Block of Toras Hashem in L.A. lays out the condition of the modern world's relationship with the Jewish people- primary contributors to Western civilization and culture. Pastor Ramin Parsa, of the Good Shepherd Church in Encino, Calif. was born and raised a Shi'ite Muslim in Iran. He quoted for the audience Quranic passages used to command Muslims to enmity and violence against Jews and Christians- which have motivated Islamic anti-Semitism for 1,400 years - centuries before the re-establishment of Jewish sovereignty in Israel. In May, 2008 - KNBC-TV News' Paul Moyer recounted the events of the shooting and the confession of a whistleblower policeman, Bob Lopez, that despite the FBI recommending special protection for the El Al counter (and his reporting having spotted "suspicious people" casing the El Al counter, not only were no provisions made, there was no police protection in the area that morning- enabling the jihadist easy accesa to shoot. Vicky and Aminov died waiting 7 minutes for airport police to arrive, and over 20 minutes for an ambulance. At the 12th Annual Memorial for the victims of the 4th of July jihadist attack at Los Angeles International Airport held by the family of the slain 25-year old Israeli-American El Al attendant, Vicky Hen, Rabbi Zvi Block reminds the west of its reciprocal responsibility to guarantee the continued contributions of Jewish people. Watch exclusive video coverage of Rabbi Zvi Block's inspiring speech - which you won't find reported anywhere but JooTube.TV. In the Pico-Robertson area of Los Angeles, Jewish teens gathered in solidarity to pray for the souls of their bretheren teens, Eyal Yifrach, 19, and Gil-Ad Shaer and Naftali Frenkel, both aged 16. Leehy, the aunt of Gil-Ad recently relocated to Los Angeles and has become the reluctant recipient of well-wishes and inspiration from Israeli and Jewish Americans. JooTube shows some of the candle-lit prayers of the gathered supporters, some of whom were locked-out of an overflow community prayer service at Beth Jacob Congregation- at which Israeli Consul General David Siegel and Leehy Sha'er appeared. KNBC-TV News's Robert Kovacik reported the story on their 11 o'clock report. Avichai ben Shmuel led Monday June 30th and Mati Cohen led Tuesday July 1st gatherings. In addition to Leehy Sha'er, neighborhood residents, Chaim Potremoly, Moti Gur, Lily Steiner, and Steve Lackner voice their opinions on keeping Jews safe from Muslim militancy. The Israeli kidnapped yeshiva boys were found dead of bullet wounds Monday, June 30, in the Palestinian village of Kachil near Halhoul north of Hebron on the West Bank. 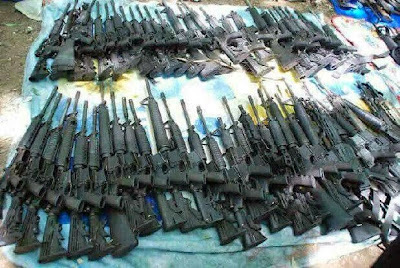 They appeared to have been thrown into a field by their abductors after a hasty effort to conceal them. Their parents were informed earlier of the discovery. The families have gone into deep mourning. The all-out search has switched urgently from Operation Brother’s Keeper to discover the boys to the hunt for their kidnappers. 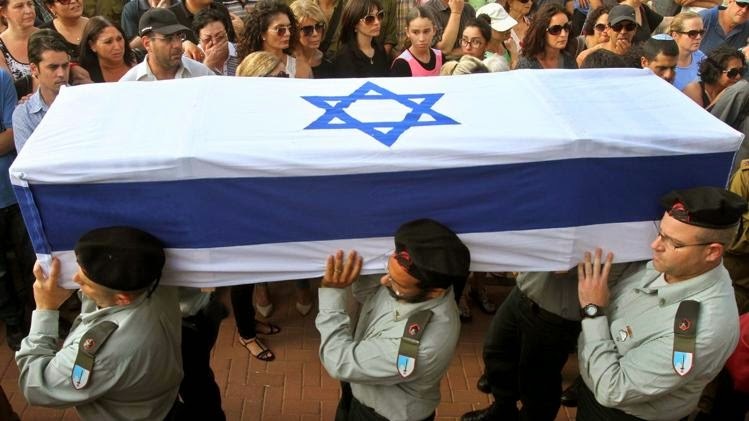 The Israeli cabinet was summoned to an emergency session Monday night to determine how to respond to the tragic deaths. The suspected abductors are two Hamas activists, missing from their homes at the same time as the boys’ disappearance. Thursday, June 26, the Shin bet security service named them as Marwan Qwasmeh and Amer Abu Aisha from Hebron. (DebkaFile). On Friday, July 4th at Los Angeles Int'l Airport, a ceremony will be held to commemorate the 12th anniversary of the El Al flight check-in attack- the 1st jihadist attack in California. The ceremony will be held beneath the central structure opposite Terminal 6 from 10:45 until 11:30am.